Specialist Manufacturers of Centrifugal, Industrial, Axial and Independently Certified ATEX & IECEx Fans. We manufacture a comprehensive range of high quality fan products suitable for use in a multitude of industrial applications. We are a long established specialist manufacturer of industrial centrifugal fans, axial fans and bifurcated fans, all designed using the latest CAD/CAM technology to provide optimum performance and long service life. Our centrifugal fan range includes: backward laminar, backward curved, flat backward, radial paddle blade, forward curved multi-vane and radial blade high pressure blowers. 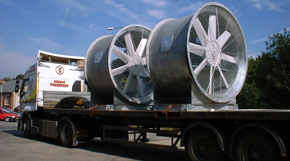 Our axial fan products include short and long cased, direct driven axial fans and bifurcated fans. Complementing our manufacturing capabilities are our support service teams composed of qualified engineers who understand the technology of fan design and operation. Through them we offer an unparalleled on-site inspection, maintenance and repair service, not just for our products but for any make of industrial fan. 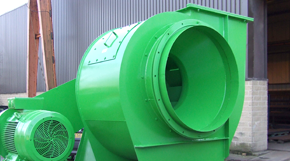 We manufacture a huge range of fans for use in applications too numerous to list but finding routine and bespoke applications in air pollution control, dust extraction, petro-chemicals, metal melting and movement, general material handling and offshore industries. Unlike many suppliers of fans we not only manufacture but offer a superb downstream servicing facility, not just for our own products but for those originally sourced from other manufacturers. We inspect, service, and repair fans on-site, ensuring minimal downtime and ensuring that fans are refurbished and placed back into service in optimum condition. 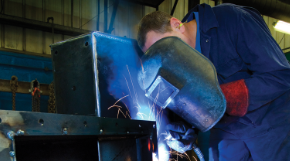 Established for over 35 years, Woodcock and Wilson have grown into the UK’s premier manufacturer and servicer of industrial fans through investment in modern equipment and the recruitment and development of a skilled and dedicated workforce. Based in the heart of the country in Huddersfield, West Yorkshire, with ease of access to the entire motorway network and two International airports, we are ideally positioned to design, manufacture, supply and service fans across the UK and considerably further afield.